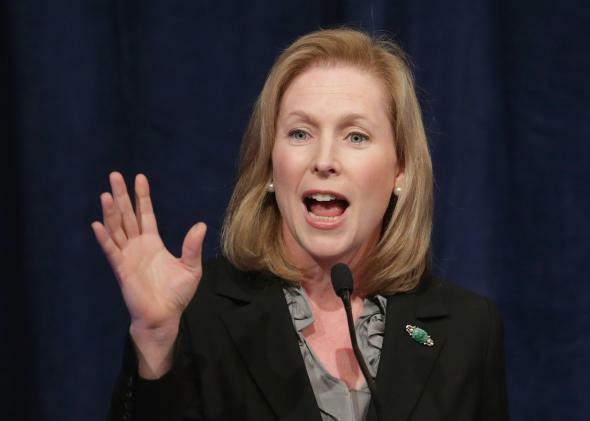 Kirsten Gillibrand sexual harassment scandal: The Senator should not name names. Kirsten Gillibrand is smart enough to know that naming names is a bad idea. Whenever a woman tells her story of sexual harassment, there are those who set to work trying to blame her—for everything from what she wore when she was harassed, to her failure to punch the harasser in the nose. Sen. Kirsten Gillibrand revealed this week that she has been subjected to sexist comments about her body from her male colleagues, and, with a distressing inevitability, the discussion quickly became about how she, individually, should be doing more to stop this harassment. Gillibrand owes it to us to name names, the argument goes, lest she court accusations that she’s lying, and also in order to bring those men to justice. When Benjy Sarlin of MSNBC pointed out that telling anonymous stories about your colleagues is standard operating procedures on the Hill, Burns argued that this was a special case. “Are they normally accusing colleagues of conduct that would trigger litigation at a private corporation,” he tweeted from the alternate dimension he lives in where an alarm is triggered and lawyers line up every time a man harasses a colleague—a very different world from ours, where most women just endure sexual harassment because hiring lawyers and risking losing your job just isn’t worth it. Do these guys sincerely think that naming names will silence the skepticism that follows any woman who claims workplace harassment? Have they forgotten the Clarence Thomas hearings, or do they just think we’ve all grown up since then? We haven’t: As Anita Hill told my colleague Dahlia Lithwick earlier this year, “these issues are all still with us.” In the real world, when an anecdote shifts to an accusation, the accused immediately denies any wrongdoing and accuses his accuser of being crazy, slutty, or some combination thereof. And should she not be able to produce rock solid proof that the harassment happened, people will take sides and tempers will flare. The accused will likely get away with it, even if he’s totally guilty, and the accuser’s reputation will be seriously damaged. Gillibrand feels she can’t even accuse anonymous people without making excuses for them. Why on earth would she invite the pointless misery that would result from naming names? Gillibrand’s stories have the potential to provoke a genuine discussion about the widespread nature of sexual harassment, which would be lost in the finger-pointing extravaganza that would result from making specific accusations. But maybe that’s been lost already: By shifting the focus away from the inappropriate comments and touching and toward blaming Gillibrand for supposedly not doing enough to hold her colleagues accountable, we’ve pretty much reached the unproductive portion of the conversation. Republicans are already exploiting the narrative that this is Gillibrand’s fault for not naming names. Frank Luntz is out there suggesting that she’s concealing their names because they’re Democrats. The only people who would benefit from Gillibrand naming names would be political reporters covering the day to day happenings of the inevitable scandal. So let’s not do this, OK? If you really are opposed to sexual harassment, then let’s talk about what we can all do to prevent it, instead of asking a senator to sacrifice her career to get embroiled in a go-nowhere “he said/she said” scandal.